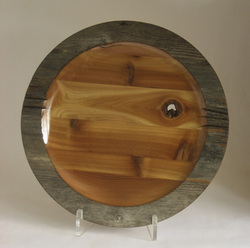 For years now, Jim has been acquiring old cedar docks from "Cottage Country", Canada and making them into beautiful bowls, chargers and platters. He usually gives the previous owner a bowl, made from his dock, in trade for the wood. What many consider firewood or worse become pieces with deep, rich colours and natural edges that reflect the passage of time. Some of these chargers are made from Eastern White Cedar and the rest are from Western Red Cedar. The reason for the two different woods stems from the '90s when the price for Red Cedar climbed fairly high and made it uneconomical to use it for building docks. White Cedar was considerably cheaper but, in the long run, it didn't have the weathering qualities of Red Cedar and had to be replaced much sooner. Size: approximately 13 1/2" in diameter x 1 1/2" deep. Jim makes these chargers as long as he has a cedar dock wood supply. To purchase one or more chargers from Jim, please contact him directly. If you wish he can personalize them for you. See the bottom of the opening Charger page for some more information on this.